Developed essential protocols for threatened species. Application of advanced tissue culture techniques for ecalcitrant plant species. Developed methods for successful transfer of in vitro propagated plants to restoration projects. Cryogenic methods that have resulted in the long-term seed and spore storage for many endangered plant species. Biotechnology transfer, through training of scientists from the home countries where many of the researched species are endemic (native). Restoration Ecology: Innovative research is conducted to enhance restoration conservation methods for endangered plant species. Soil microbe propagation and research for endangered plants that require microbial associations for their survival. Improved recovery methods for rare and threatened plant species. Research on various factors that limit species establishment in their natural habitats. 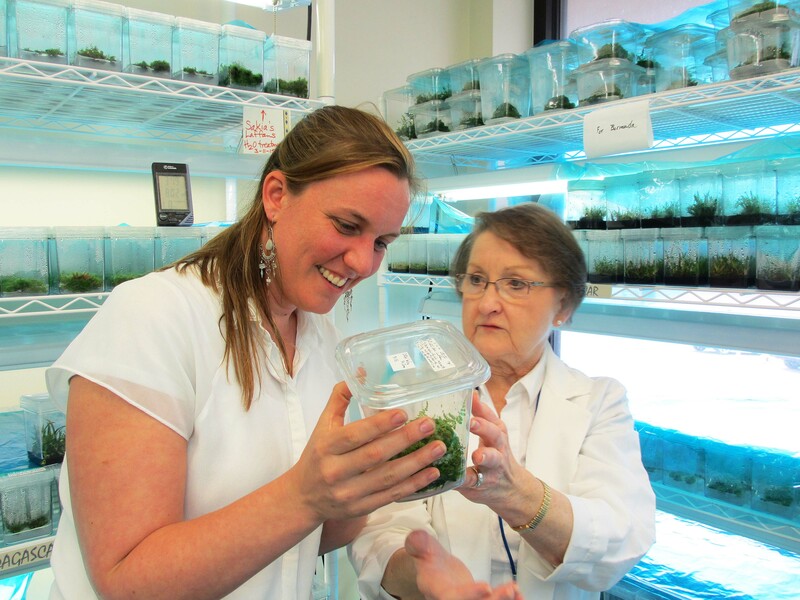 Micropropagation and tissue culture techniques to produce large numbers of threatened species used to support restoration projects with multiple government agencies and univeristies. Direct participation in species restoration projects in North America, Bermuda and Madagascar for many of the species researched by Omaha's Henry Doorly Zoo and Aquarium Department for Plant Conservation. Field studies of the natural habitat through soil study, precipitation records, microbial soil contents and temperature factors for each of the threatened plants currently researched in order to develop successful stress assessments for re-established species. Conservation Seed and Spore Science: Research into seed and spore dormancy and germination requirements. The laboratory develops successful methods for seed germination of native plants used in habitat restoration projects in several countries. Determine specific seed and spore dormancy types for difficult species. Research seed storage behavior and longevity through cryogenic techniques for effective seed and spore banking at Omaha's Henry Doorly Zoo. Technology transfer to visiting scientists, for successful propagation and reintroduction methods that are applicable in a species' home country. Why Plant Conservation is important at Omaha's Henry Doorly Zoo and Aquarium? Thousands of square miles of rainforest are destroyed each year. It is estimated that for every plant species that goes extinct 10 to 30 animal species, insect or microbe disappear with it. Worldwide nearly one in eight plant species faces the possible threat of extinction. Yet animals and humans can not survive without the plants that provide their food, shelter, medicine and cover. The lab is dedicated to expanding our plant conservation efforts so that future generations can enjoy the beneficial products and aesthetic benefits that plants provide and to ensure that these endangered plant species continue to exist on earth. Instititute of Museum and Libary Services, 'Cryopreserving the Imperiled Plant Collection' of Madagascar. Omaha’s Henry Doorly Zoo and Aquarium’s plant laboratory was involved in the conservation, eco-rehabilitation and bio-technology transfer to government personnel of two endemic Bermuda fern, one of which is Bermuda’s most endangered species and has not been seen in the wild since 1905. Ex-situ propagation was carried out for both fern species and thousands were returned to their native habitat. More reintroductions are in Bermuda are planned for 2014. Omaha’s Henry Doorly Zoo and Aquarium began working with Madagascar orchids in 2000 as part of a collaborative project with the National Genetics Resources Bank in Fort Collins, Colorado. The project involves field biology studies in Madagascar, seed collection, genetic sampling, GPS mapping, orchid habitat and species documentation and the involvement of local residents. The educational components of the project include biotechnology training for Malagasy nationals at Omaha’s Henry Doorly Zoo and Aquarium, seminars at the University of Madagascar and the United States Embassy in Antananarivo and involvement with local school children in Madagascar. Thousands of Malagasy orchids were propagated at Omaha’s Henry Doorly Zoo and Aquarium’s plant laboratory. The National Genetics Resources Bank assisted in seed cryopreservation and helped determine best practices for cryobanking. Young plants were taken back to Madagascar in-vitro and re-established in their natural habitat in Ranomafana National Park in 2004 and 2005 to supplement the orchid population where the seeds were previously collected. Seventy percent survived the reintroduction process and are blooming with fruits. A portion still remains at Omaha’s Henry Doorly Zoo and Aquarium for future research, hands-on training for Malagasygraduate students and professors and for educational use. Many Malagasy orchid cultures are initiated in Omaha’s Henry Doorly Zoo and Aquarium’s plant laboratory. Hundreds are grown in the Zoo’s greenhouse for future Malagasy exhibits. The Smithsonian Institute in Washington D.C. was another collaborator on this project. This is where excess plants at the Zoo are entered into the national collection housed at the United States Botanical Garden. The Association of Zoological Horticulture awarded a three-year grant to Omaha’s Henry Doorly Zoo and Aquarium’s plant laboratory for training workshops in South Africa. South Africa has a number of threatened plant species, including medicinal plants, and hasn’t established a system to preserve native plant seeds. Omaha’s Henry Doorly Zoo and Aquarium, in collaboration with other organizations, will carry out cryopreservation workshops to train South African collaborators and establish a cryobank. The little white ladies slipper orchid is currently being researched, both in-situ and ex-situ, at Omaha’s Henry Doorly Zoo and Aquarium’s plant laboratory. Cryopreservation of seeds from this species is carried out to conserve the Nebraska genotypes for future reintroductions. Omaha’s Henry Doorly Zoo and Aquarium’s plant laboratory has also directed their focus to the Great Plains ladies tresses orchid. In-situ reintroductions have been made at Wildlife Safari Park and additional reintroductions are planned for regional reserves in 2014. In collaboration with the University of Nebraska at Omaha and Fontenelle Forest, Omaha’s Henry Doorly Zoo and Aquarium has initiated a new project involving little yellow lady slipper orchids, a native species known from only one population in Nebraska. All organizations are working together on this in-situ and ex-situ conservation project to ensure proper propagation, DNA studies, plant community census, soil analyses, symbiont isolation and future reintroductions are carried out. Omaha's Henry Doorly Zoo and Aquarium and the National Genetics Resource Bank in Fort Collins, Colorado, are currently working to restore the population of Madagascar orchids in the wild. A co-authored paper is planned to be released on both organizations' most recent efforts.